I'd like to pass along this fabulous gift idea for the little travelers in your life! An exciting product called Little Passports will teach your child geography, history, culture and language in a fun and interactive way. 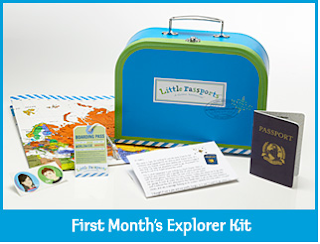 Starting with an Explorer Kit, your child will then receive monthly Adventure Kits where they journey to new countries. This product has been featured on KTLA Morning News and has been endorsed by Parent Magazine, Disney Family Fun, and Scholastic Parent and Child Magazine. Great educational value and fun! Special Offer for Cool Mom Picks readers: Get 15% off your order at Little Passports with "CMP15" through 12/15/10. That's really cool. I admire the fact that you travel with your children. We'd love to travel too but it's not just the money... the thought of flying with 3 kids and hotels etc.. makes me hesitant. It's inspiring to meet moms who actually do it!